March 23: Frodo and Sam in the wastes of Gorgoroth. 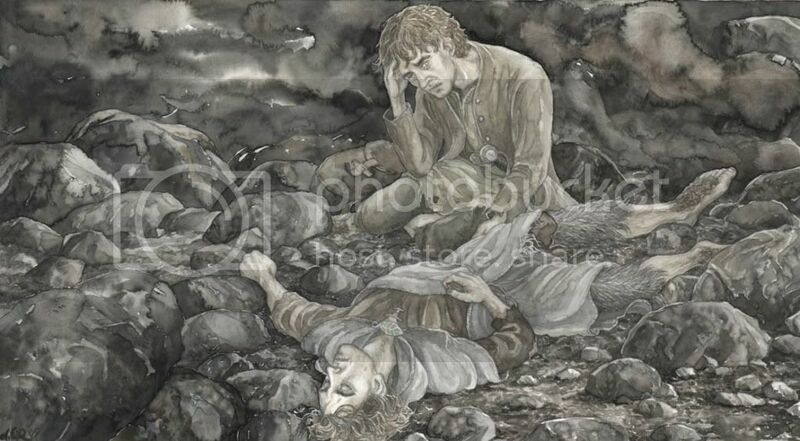 I don't like everything Anke Eissmann has done, but her picture of a distraught Sam beside an unconscious Frodo is "worth a thousand words". You will have to judge for yourself. Born in Dillenberg, Germany in 1977, Eissmann is a younger artist whose portfolio is already bulging with work. Besides reams of Tolkien illustrations, there are myriad pictures made for other works. If you are interested, Eissmann's online gallery is extensive. He could not sleep and he held a debate with himself. ‘Well, come now, we’ve done better than you hoped,’ he said sturdily. ‘Began well, anyway. I reckon we crossed half the distance before we stopped. One more day will do it.’ And then he paused. they are already at peace. * Heartfelt thanks to jan-u-wine for writing the scene intro.